I always knew that Motor Scooter, the cat, from Lakeville MN was special. 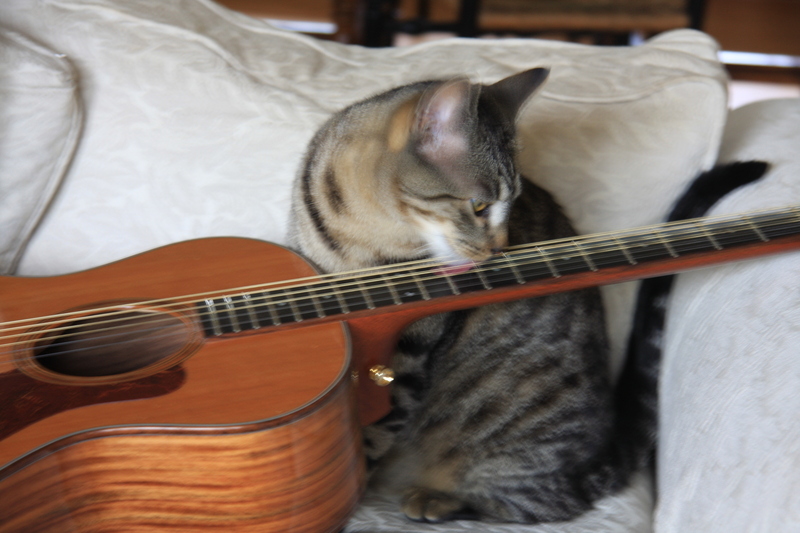 Here he is playing the guitar. He never ceases to get tired of it. 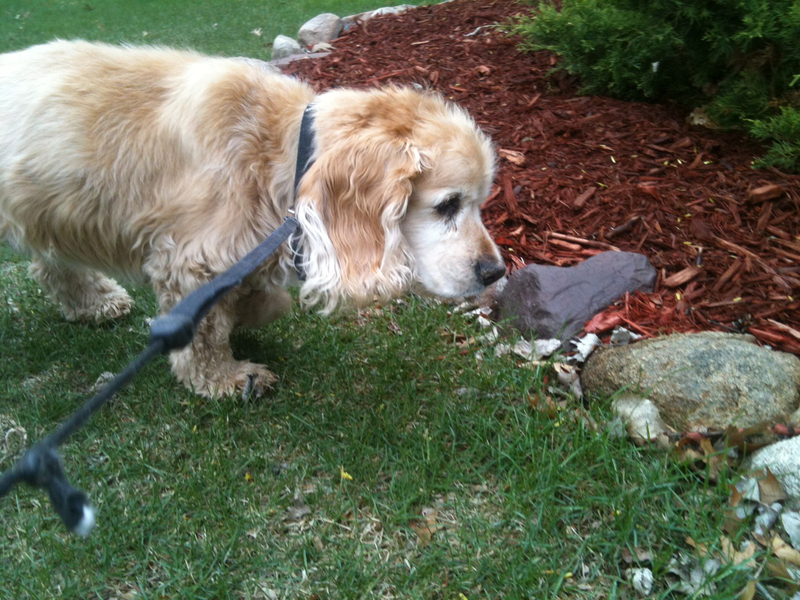 I had the pleasure of taking care of Jack this past year, a wonderful Cocker Spaniel, who had an indomitable spirit. Jack was 16 years old (that’s 80 years old in human years) but so young at heart. 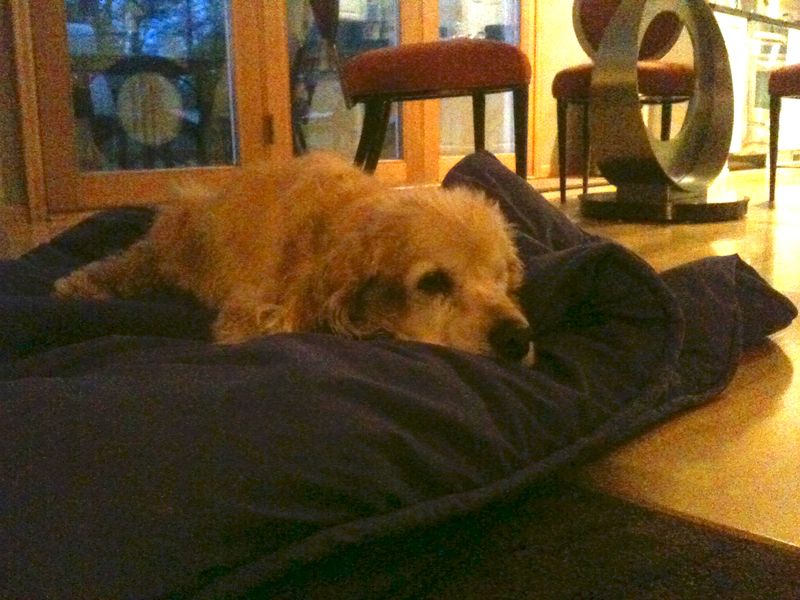 He had to have surgery to remove a “bad” eye, but the thing about Jack is – he kept right on going. Jack inspired me with his ability to get up and get excited about going for a walk. 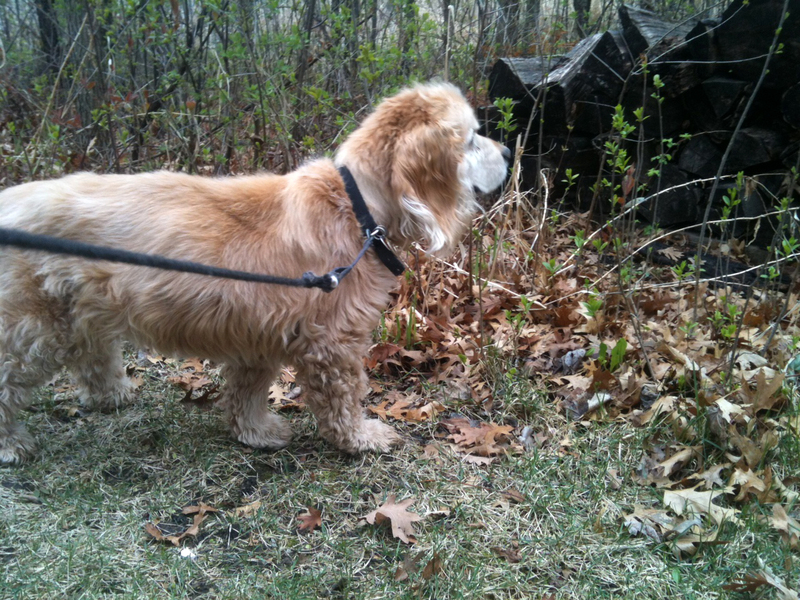 He took me on many walks and especially loved to go behind his house – down the winding woodland paths. Jack on his way to the woodland path. Jack looked out and listened to the sounds of nature. The path led to a pond and wildlife. He knew his yard like the back of his “paw”. 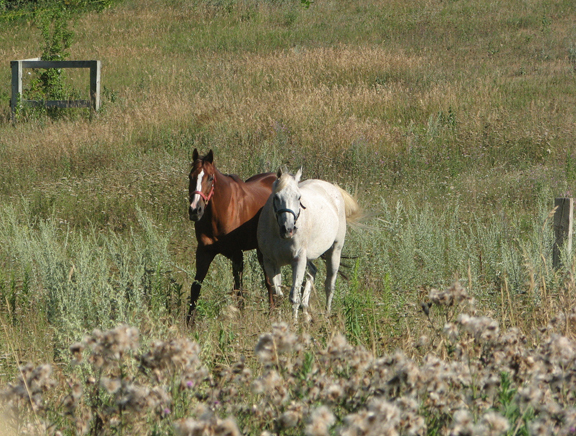 He often started out a little slow but then all of a sudden he would start to trot as though he was a young man again. The sun would shine on his face, the Spring scents were in the air, the geese were honking – all was right with the world. Yes, Jack was very happy dog – a very special dog. I will miss him. dreaming of his youth and running with wild abandon. 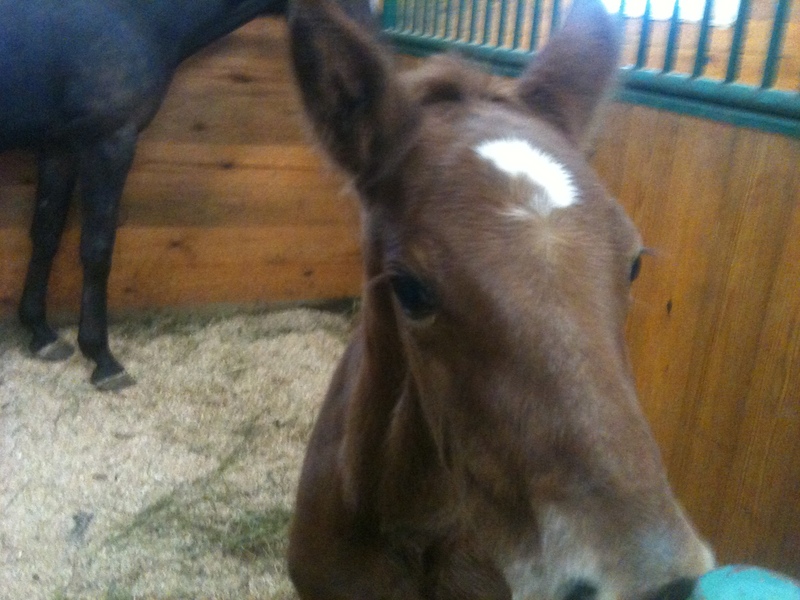 I got word that there were some newborn horses over at Cross Creek Farm. 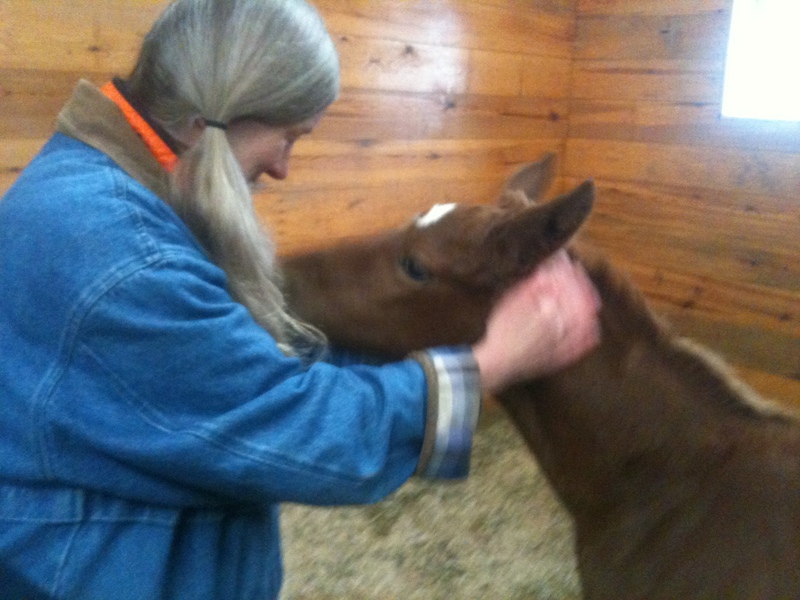 I met my friend Holly over there, as she volunteered to help with the mothers and babies. It was quite a treat to see the mommas and babies bonding together. 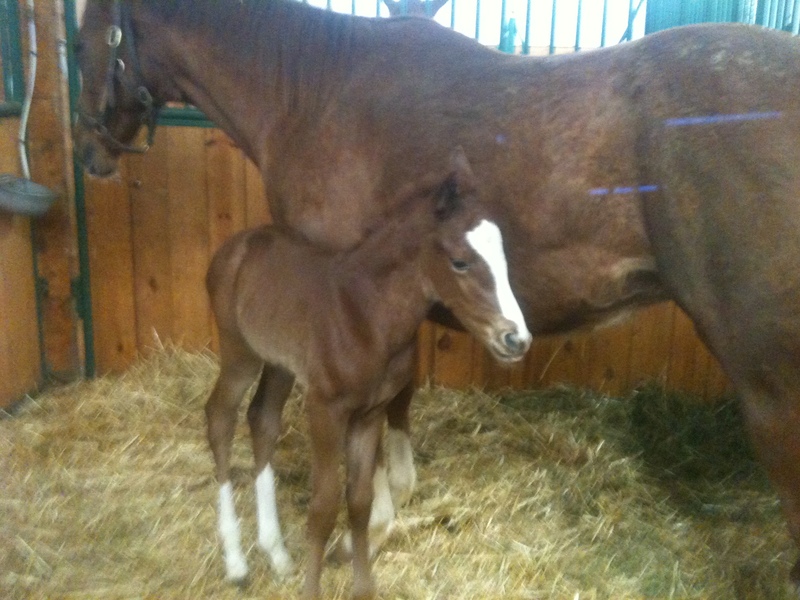 Each horse had their own unique personality and the babies were very curious and friendly. 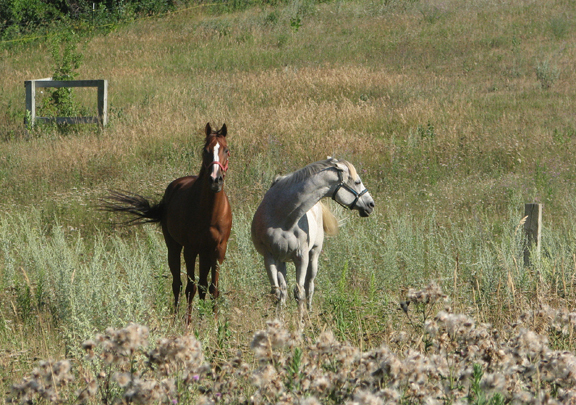 Some were skiddish as I’m sure it took time to get used to their new world on the Farm. What to do if your cat is lost. These events are true. My customer’s cat, Teddy, ran out the door last week when she let the dog out in the evening, and they did not notice he was gone until the next morning. These tips on finding your pet are for Dakota County residents but could be applied in many places. Teddy was gone – now what? I just checked for where people might drop off a lost cat. I called Lakeville Animal Control (which is the same as the police) 952-985-4800. Long story short – I called them and they said if an animal is lost they recommend people bring it to Dakota Pet Hospital. So, I called Dakota Pet Hospital (952-469-1525) and they told me they only take in injured cats. Healthy cats are on their own and must depend on the kindness of strangers. 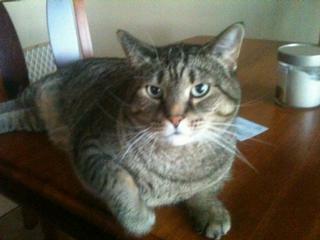 From what I can gather – if someone finds a cat – they will probably keep it or it could end up at a shelter. I got the names and phone numbers of 3 possible shelters from the Pet Hospital. So, our best course of action right now is to make a flyer and put around your neighborhood. I don’t know if there is an association there that could distribute a pdf but that might help. Is there a neighborhood email list? I don’t want to overload you with info but wanted to get the options out there. I’m going to go back over and check again shortly. I have to start my visits. Talk to you soon. Let me know if you want me to make a flyer. If so, could you send me some copy for it? Heidi made flyers and put them all over her development. I helped put flyers in people’s boxes and doors. One week to the day that Teddy left, a neighbor who had seen the flyer, called to say that he saw Teddy. Heidi met the neighbor at the location about 4 blocks from her house. Teddy came to her. He had lost weight and been living on his own for a week. We never gave up on Teddy and the main thing I learned form this it to put a flyer out with your pet’s photo on it. Spread the word and people will help look. If it weren’t for the neighbor who had seen the flyer – Teddy would still be outside trying to survive as the weather was getting colder. A couple of weekends ago, I saw a fox out my front office window. I had seen this fox many times go by my window and consider him part of the neighborhood. This time was different though. The fox was convulsing and writhing in pain. When I went outside to investigate; the fox appeared unconscious but was still convulsing. Buzz and I put the fox in a box and rushed it to the Wildlife Rehabilitation Center in Roseville. They responded to my inquiry a few days later. Although we can’t say for sure why the fox died – they suspected it could be some kind of toxin, like eating a poisoned mouse. I can’t help but think about people’s pets in the neighborhood and worry for their safety. 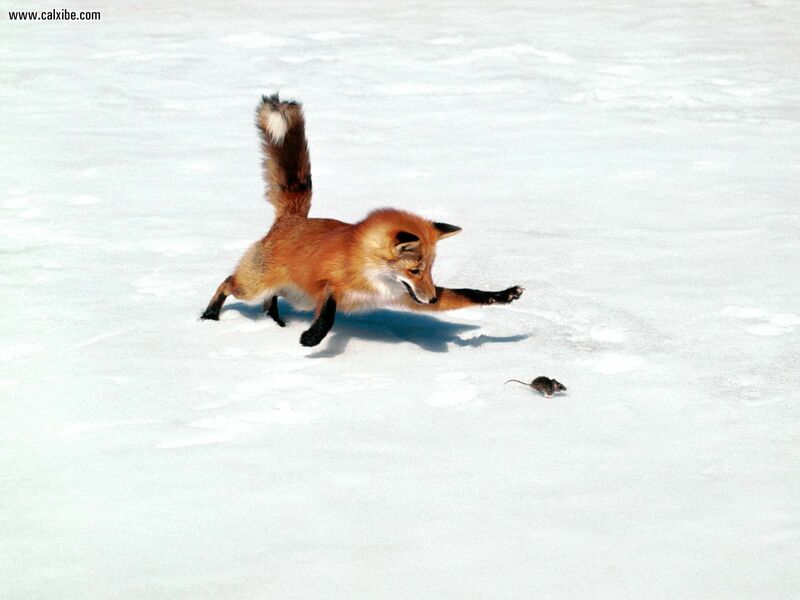 Foxes eat lots of mice which is a great natural control method. If you know of anyone using poisons – please tell them about this sad story and the dangers it may cause. 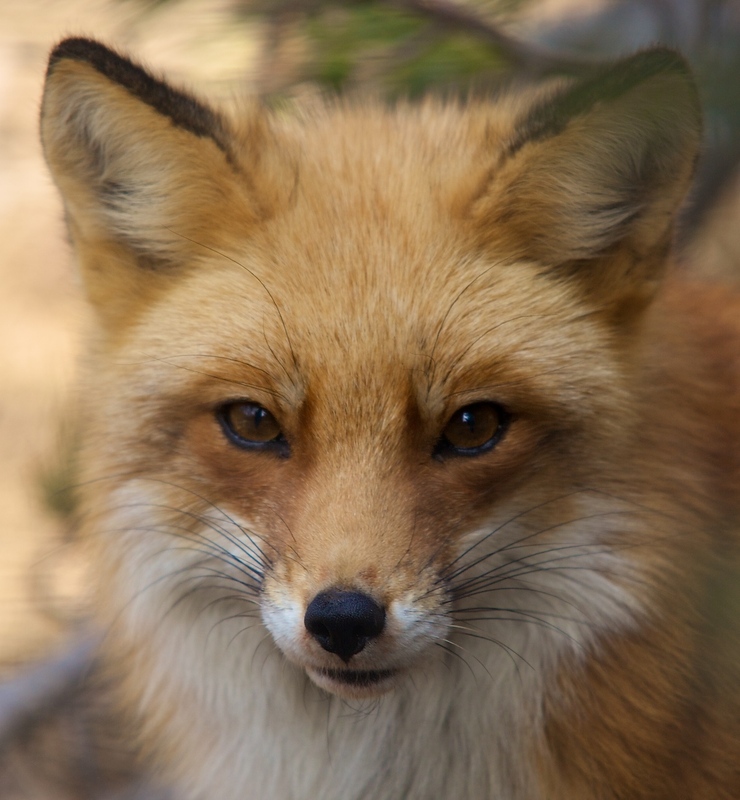 Foxes like to eat mice and other rodents. We regret to inform you that the Gray fox you brought to us was unable to be rehabilitated. The vets administered emergency care giving drugs to help with the seizures and other issues. Despite this care the fox died shortly after admission. The vets cannot say for certain but do suspect some type of toxicity possibly poison from eating another animal that had been poisoned like a mouse or other small mammal. Thank you for rescuing the fox and bringing it to our center. http://www.wrcmn.org/ or by giving your time as a volunteer. Here’s a little reprieve from the winter’s snow and ice. 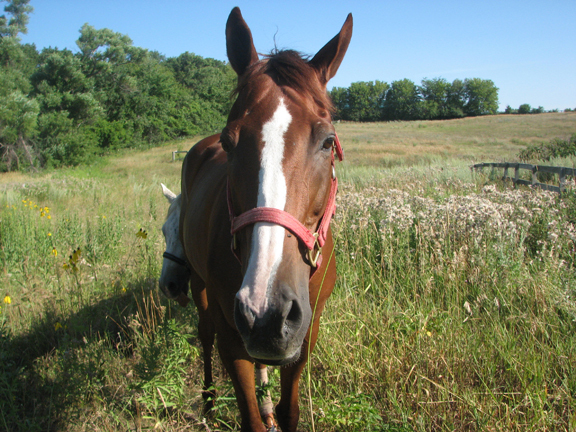 The photos were taken when Buzz and I were checking the nature preserve for invasive plants. 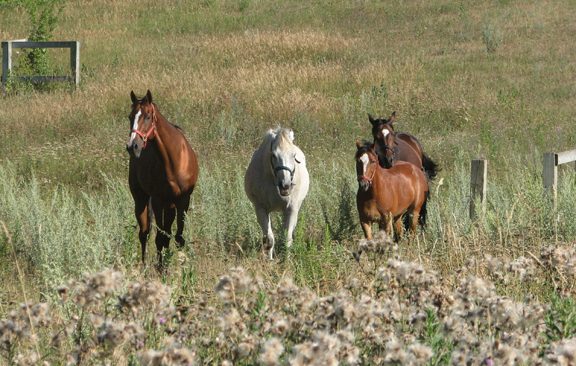 We were near a horse pasture and they seemed to gravitate towards us – beckoning the others to come over and visit. Hey Ed – Check this out. What’s that thing you’re clicking? Last year, a family of bluebirds nested right outside my office window. It was so much fun to watch them build their nest. The eggs hatched and mom and dad both helped feed the babies. The first clutch was successful and they all flew the coop. Typically, bluebirds will have 2 clutches a season. The nest needs to be cleaned out and they will build a new nest. Soon after building their second nest, I observed the bluebird poking his head in and out but not going inside. He looked perplexed. I went out to investigate. When I opened the door to the house, to my surprise – I found a frog inside the house. I assisted in getting him to a nice safe place and figured it was just a fluke. The next day, I observed the bluebird doing the same thing – poking his head in and out over and over again. I opened the door to the house and who do you suppose was there? Mr. Frog was back in the exact same spot. I discovered it was a Gray treefrog who happens to be very fond of wood, trees and bark. I moved the frog even further away and the bluebirds had another successful clutch. Perhaps Mr. Frog turned into a handsome prince and lived happily ever after. About 3 years ago, I started taking photos of the critters we have running around in the yard. It is fun to see how wild animals respond to people. Some are not phased at all and don’t flinch a feather or paw when humans are close by. It is as if we are all living in perfect harmony. To start the new year off, here is an introduction to one of the regulars. The Squirrels – Pinky and her baby Winky. One day I saw Pinky moving her babies into the brand new woodpecker house. They really liked their new digs. The snow keeps coming down and turning the world into a winter wonderland. I really like snow hugging the trees. 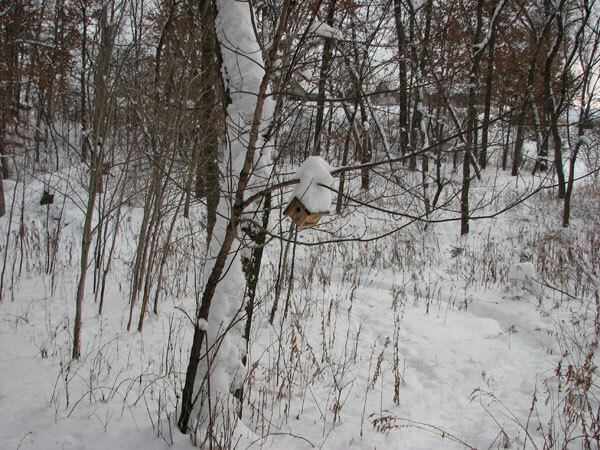 We decided to go snowshoeing 2 days ago and as we made our way through the backyard, we walked towards the wren house that Buzz put up last summer. All of a sudden we stopped in our tracks as a little face peered out at us. Buzz asked, “Is that a face I see?” It was…Trixie, the mouse we named a few summers ago. Of course I didn’t have my camera but there she was, plain as day, sticking her head out of the wren house – cute. I didn’t know that mice liked to climb trees. She was safe and sound in her cozy abode. I went back later and took a photo of the wren house but she did not make and appearance.